films. Grown up ones to watch: Deadpool and Jessica Jones as well as the mainstay box office favourites like the Avengers, Batman, Superman etc. homework now. 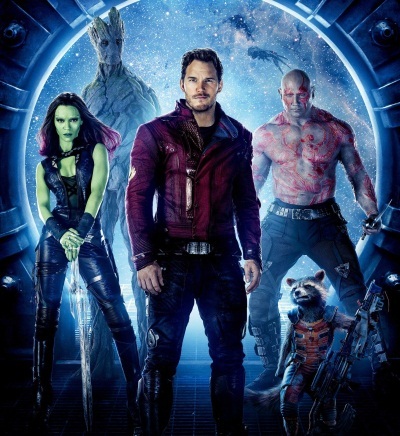 Technically speaking – much like the first Guardians of the Galaxy film – you should be able to watch and enjoy them without having to know the detailed backstory of the plot or how it fits in with other Marvel stories (when you know all about Infinity Stones you feel like you’re in a secret club though and can be very pleased with yourself and easily impress anyone under 14 with this knowledge). Sexiest Man Minnesotan, family guy Chris Pratt plays the unlikely hero Peter Quill aka Starlord: charming and witty but ultimately one of the good guys. Vin Diesel as a mono-syllabic humanoid tree, Bradley Cooper voicing a talking racoon, Benicio del Toro in a bouffant wig, Glenn Close looking fab in miltary uniform…and a bloke from Hollyoaks. What’s not to love? Awesome Mix Vol.2 in Guardians of the Galaxy II.